Orchard Lounge has made a name for themselves performing around the country as a trio of like-minded DJ's. They can play to any room, at any time. I've seen them throw down countless sets, and am more then excited to see their long awaited return to New York City. Three hours in an intimate venue. You are now in an Orchard Lounge. "I could be wrong here, but I believe OL did three of their NYE runs: 2007, 2010, and 2011. As far as being a fan, my first show was during a NYE run - 12/29/98 at the Wetlands. That was also the debut of Above The Waves. I was just a young college kid in NYC to see Phish but we were listening to their studio album Uncivilized Area a lot and were very excited to see them do a late night. " Luke Bemand is 1/3 of the power trio Lespecial. The band has solidified themselves as one of the most talented and original bands in the northeast, and they're steadily expanding their fanbase across the country. After just releasing their new project CHEEN, they opened up for the Disco Biscuits in Worcester, MA. I caught up with Luke to discuss what's been happening with Lespecial as they finish 2017 strong. Michael Hickey has been a staple in the Warwick Valley music scene for years. Not only has he given people enjoyment through music, he is one of the most skilled music educators in the Hudson Valley. I took drum lessons from him for many years, and I owe him a lot for my love of music. Check out what he has to say about his journey over the years; from playing in rock bands, to teaching kids, to playing in an acoustic duo with his wife - this man has done it all. The music scene has had it's fair share of tribute acts and artists. Some end up being big hits, and others fall by the wayside. Tractorbear is a Disco Biscuits tribute act that initially made big waves in the northeast music scene. After playing memorable shows for Biscuits fans in multiple cities, they decided to hang it up for a while. After further deliberation, they agreed that it's time to return to the circuit, and deliver their take on trance-fusion for anyone that's willing to hear it. New York City has always been a breeding place for music. One generation to the next; from rock n' roll to hip hop, and jazz to electronic - NYC is a platform for musical evolution, some fail and others succeed. Space Bacon is a band that will most definitely succeed. Combining ambient elements with trance-fusion and metal-core, Space Bacon has continued to expand their fan base in the tri-state. See what keyboardist Chris Gironda and guitarist Jack Willard had to say about the band's inception, musical inspirations, and mission for the future. When it comes to a rock show, the lighting designer can be just as important as the musicians. He has a major role in making sure that the show becomes engraved in the minds of the audience forever. 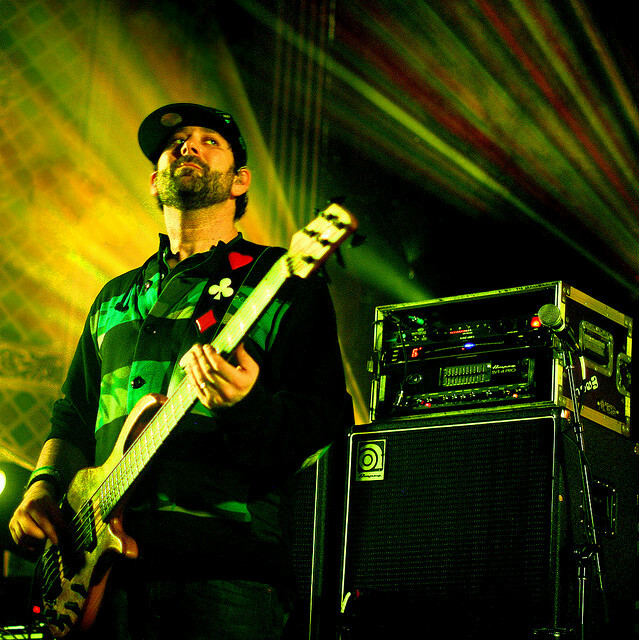 The Disco Biscuits have become known for their light show, and Johnny R. Goode is the main reason for that. Since 2002, he's been lighting up the stage and taking the band's live show to the next level. Todd Stoops has proved himself as one of the most unique musicians in the live music scene. He's played with countless bands and artists all over the country, and he cannot be stopped. See what he has to say about his current situation and projects. Scott Hachey and The Magic Beans have solidified themselves in the Colorado music scene. For the past five years, they've toured throughout the entire state multiple times. From Denver to Aspen and everywhere in between, the band has made a lasting impression on music lovers. In this interview he talks about the past, present, and future of the band along with what's on the horizon for 2016. Wiley Griffin has undoubtedly proven himself as one of the most talented guitarists in the live music scene. He brought a breath of fresh air to MUN when he joined and now he's doing the same with Teddy Midnight. In this interview, it's quite evident that WIley plans on sticking with Teddy Midnight for the long haul. See what he has to say about his influences, collaborations, and the future of Teddy Midnight! Marc Brownstein is undoubtedly one of the biggest faces in the live music scene. For the past twenty years he has been delivering memorable shows to fans all over the country, all over the world. From the Disco Biscuits to Conspirator and Electron, he has helped to pave the way for the musicians who've come after him. I had a chance to ask him a few questions about the Biscuits and their upcoming New Year's Run. If you're a fan of the Disco Biscuits, you're going to want to read this interview. During Catskill Chill 2014 I had the chance to interview Marc Brownstein (the Disco Biscuits, Electron, Conspirator) and Mike Greenfield (Lotus, Electron). This took place before The Passion Collective was built so it was published on a different website, who has since deleted it. I have dug it up from the archives and re-published it for fans to read. Mind you it's from 2014! "I didn't want to just get back to where I was, I wanted to come back as a much better DJ. I feel like I've improved significantly. A big part of that is being sober and that is something I am very proud of. I was partying too much before and now I realize that I can focus and hear the music so much better. I was able to do much longer mixes and try things that I never had before. The music even sounds better to me sober." Catskill Chill is proud to consider Tom Hamilton a part of the ChillFam. Tom Hamilton has proven himself time and time again as one of the best musicians in the live music scene. His hard-nosed work ethic and masterful dedication to his craft are both undeniable. From his early years of fronting Brothers Past to his present day collaborations with members of the Grateful Dead, Tom Hamilton has never allowed himself to become complacent, he's a standout musician and a stand up human being. Esseks (Sam Eckstein) is a Brooklyn based producer and artist who creates emotionally driven electronic music and visual art.... His music is influenced by a variety of styles from J Dilla inspired hip-hop beats, melodic bass, house and even blues and swing. Jackson Whalan is an individual who was put on this earth for one singular purpose - to create. Over the past few years, he has been doing just that; from writing intelligent, eye-opening lyrics to producing psychedelic dance music with heavy grooves, Jackson Whalan is one of the most driven artists in the scene. His passion is unmistakable as his music constantly evolves with unique progression. Jackson Whalan encapsulates everything that's pure about the artistry in which he represents, this is his life. Wiley Griffin is an absolutely amazing guitarist, he is easily one of the very best in the Northeast live music scene and beyond. He continuously proves himself again and again by playing various styles on numerous stages with multiple bands and artists. Everybody loves Wiley Griffin. AJ Gillman is a Pennsylvania native who relocated to Denver a few years ago. He’s a very talented drummer who has worked vigorously at his craft. AJ knew that Denver would be the place to make his dreams of playing music professionally come true. Luke Miller and his band Lotus have continued to redefine themselves, stepping in and out of a multitude of genres over the years. He has remained the main songwriter of the five-piece and has proved himself time and time again as being a master of his craft.